Jochen Topf introduced a new QA tool called Osmoscope. He wants to avoid the drawback of current QA tools, which is that the person who operates the tool decides which layers are shown. With Osmoscope running on a web server, a user can add QA layers by entering the configuration i.e. a URL that points to a description of a new layer. In other words you create a GeoJSON with possible OSM issues and add it to Osmoscope which takes then care of visualisation. If your GeoJSON contains thousands of potential issues, you should think about using vector tiles. A proof-of-concept implementation is available at osmoscope.jochentopf.com. Issues can be reported on GitHub. Joseph Eisenberg wants to render radio telescopes but noticed that what he considers the “possible tagging mistake” man_made=radio_telecope is used over 200 times while the “correct tag combination” man_made=telescope with telescope:type=radio is only used twice as much. Bren Barnes is asking for suggestions for his proposal to introduce amenity=research_station. The new tag telecom=* was accepted and now enables mappers to add last-mile networks and related equipment like DSLAMs. In Belgium the law was changed to add “School streets” (automatic translation). These are streets adjacent to the entrance of a school that are shut off from all traffic except for pedestrians and bicycles around the times the schoolday starts and ends. User marc marc started a lengthy discussion on the tagging mailing list by pointing to the topic that crossing=zebra, which is assumed to be a shortcut for crossing=uncontrolled + crossing_ref=zebra, prevents mappers from adding crossing=traffic_signals for crossing with zebra and traffic signals. However, a much bigger tagging problem became apparent during this discussion: The maintainer of the OSM editor iD adds or removes tagging presets he is “tired of hearing people complain about”. Keeping in mind that one can control the way people edit if one controls the presets in an editor that accounts for roughly 50% of all uploaded changesets, the change of a preset should not be controlled by one or a few developers. Michael Spreng introduced (automatic translation) the new design for the Swiss OSM website. There is still some work to do, such as translations, but it already looks promising. Melanie Eckle announced that HeiGIT/GIScience from the University of Heidelberg and German Red Cross signed a Memorandum of Understanding to strengthen their strategic partnership to conduct joint activities related to research as well as development of GIS technologies, skills, workflows and communities. User cbeddow has started OpenStreetMap Montana, and is seeking mappers from all parts of the state to join and plan local meetup events. The Mapper of the Month October 2018 as chosen by OpenStreetMap Belgium is Aylin Kızılaslan from Turkey. The Wikimedia Foundation has started the call for proposals for the wishlist 2019. WMF is open for ‘feature requests’ from the OSM community. 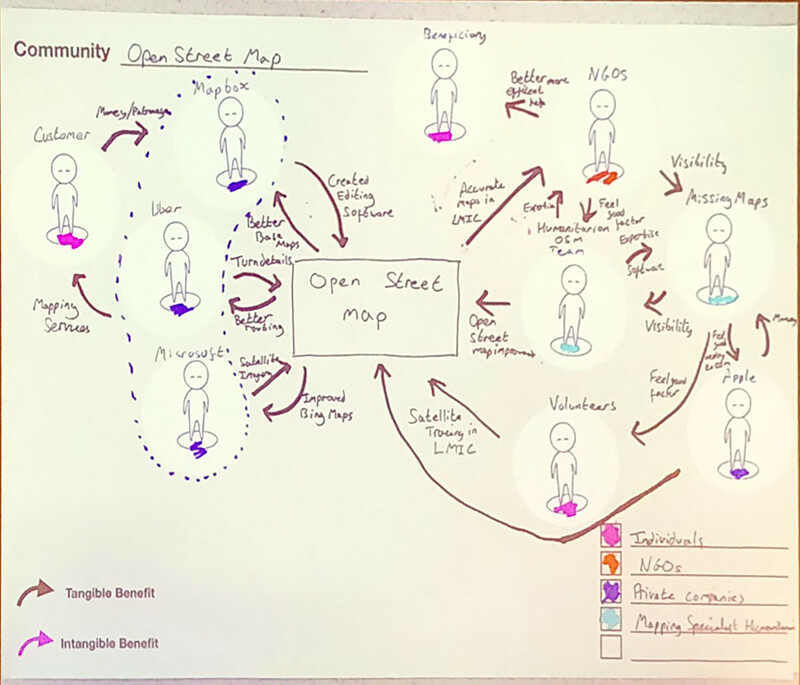 An interesting chart labelled ‘Community OSM’ was drawn by Simon B. Johnson during the GeOnG conference as reported in a tweet by Paul Uithol. Common mappers, who go out surveying rather than tracing aerial images, might have difficulties finding themselves in the chart. Pieter Vander Vennet announces on the imports mailing list that the Belgian community plans to integrate building footprints from multiple Belgian governmental sources into OSM. The plan is to include external IDs in the import, which received loud criticism as well as support. As it’s more of a slow integration effort, rather than a bulk one-time import, which depends on said external IDs to work efficiently, the plan is to still include them. OpenStreetMap Belgium, the newest local chapter in the OSM family, introduces itself in a blog post. OSM’s local chapter in the UK responded to the Geospatial Commission’s call for evidence. OSM UK supports the efforts to use public and private sector geospatial data more productively. They believe that OSM plays an important role in that area. The whole response is linked to at the end of the blog post. Chetan Gowda announced that the SotM Asia will take place in Bengaluru (a.k.a. Bangalore), India on November 17-18. Don’t forget to register! The community day at the FOSS4G SotM Oceania 2018 will be on Friday, 23rd November. The programme for the day was just announced. Registration for FOSS4G Oceania (20–23 November 2018, Melbourne) is open. Geofabrik usually organises two or three hack-weekends each year in their own offices. Christine Karch tells us in a blog post (automatic translation) that the most recent event had to switch to a larger location at Karlsruhe University, as 9 people joined to plan the next SotM in Heidelberg, plus 7 JOSM developers seized the opportunity to meet face to face and discuss long-standing issues. As part of the non-profit project openminds.at, the Austrian Open Source Award (automatic translation) will be presented for the second time on November 9. An Open Source Ball will take place afterwards. OSMF’s new Belgian local chapter is planning their first official meeting during the week of November 13th. The United Nations Population Fund reports how Crowd2Map Tanzania is using OpenStreetMap to fill gaps on maps in rural Tanzania to end Female Genital Mutilation (FGM). A short summing-up shows HOT’s preliminary conclusion after 3 weeks of its Hacktoberfest. HOT thanks everyone who has worked on issues related to usability and experience of the Open Source tools, performance, and general bug fixes. There are several Missing Maps events around the globe during November where you may want to participate. Gastronomy objects will no longer be displayed by small icons in zoom level 17 but by orange dots as they often created a visual clutter. Recreation.gov combines campsites and facilities from 12 US federal government bureaus, allowing users to search and make reservations. Until recently, search results were displayed on a Google map, but the new website includes a makeover with OpenStreetMap and Mapbox as the basemap. We have reported before rescues of hikers occasioned by the use of OSM without evaluating the terrain by other means, such as topo maps. Now, according to CBC Canada, a hiker had to be rescued by helicopter from the top of a cliff in British Columbia. Allegedly the hiker was benighted because they relied on Maps.me for an estimate of how long it would take to walk in the mountainous terrain. An issue was reported in 2017, but it is not entirely clear if the situation still exists with the current version. The world’s most visited cemetery is Père Lachaise in Paris. Super Lachaise, an iOS app, allows you to easily find historical monuments and prominent graves. Rémy Mathieu wrote a blog post titled Rendering a map using Go, Mapbox and OpenStreetMap where he explains how to retrieve and draw map data. He plans to write another article as he aims to finally render fantasy styled maps. JOSM release 14382, version 18.10 is out. The enhancements include a new option to show the object version in lists, an increased default overpass wizard timeout, the cut of overlapping GPX layers when merging, the MapCSS function is_similar and many minor improvements. QGIS 3.4, the first long-term release of version 3, has just been published. New expression functions and code completion for the expression builder have been added to this version. netidee is the largest Open Source Internet promotion in Austria. netidee stands for openness, transparency, and sharing. The results of all funded projects are available to the public for use and further development (“open source principle”). Mapping London wrote an article about a map that shows the modelled 2020 annual pollution levels of NO2 based on data from the London Atmospheric Emissions Inventory 2013 (LAEI). The map was created using Mapbox’s 3D WebGL libraries and is client-side rendered. Garmin continues its famous GPSmap series with the Garmin GPSmap 66s. The German biking website gpsradler.de has published (automatic translation) a test of the new GPS handset. The map for historical items at gk.historic.place is now linking to the US National Register of Historic Places (NRHP). This weeklyOSM was produced by Nakaner, PierZen, Polyglot, Rogehm, SunCobalt, TheSwavu, YoViajo, derFred, geologist, jinalfoflia.